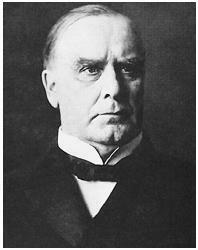 William McKinley served as the twenty-fifth president of the United States, from 1897 until his death from an assassin's bullet in 1901. A conservative Republican who advocated high tariffs to protect U.S. industry, McKinley waged the Spanish-American War and at the end of it gained overseas territories for the United States. McKinley was born January 29, 1843, in Niles, Ohio. As a young man, he briefly attended Allegheny College, in Meadville, Pennsylvania; taught school; and fought in the Union army during the Civil War, attaining the rank of major. McKinley was aide-de-camp to the regimental commander, rutherford b. hayes, who was later governor of Ohio and the nineteenth U.S. president. After the war McKinley studied law with an attorney and attended Albany Law School, in New York. He was admitted to the Ohio bar in 1867, and established a law practice in Canton, Ohio, which remained his official residence for the rest of his life. From 1869 to 1871, he served as county attorney. McKinley's political ambitions were nurtured by Hayes. McKinley became active in Ohio Republican politics and was elected to the U.S. House of Representatives in 1876. McKinley was an outspoken advocate of higher tariffs, believing that U.S. industry and U.S. workers were protected by the taxation of imported foreign goods. His stand on tariffs culminated in the McKinley Tariff Act of 1890, which raised duties on many imports to the highest levels up to that time. The act was an unpopular measure, and McKinley was voted out of office in the election of 1890. McKinley returned to Ohio, where he was elected governor in 1891 and reelected governor in 1893. Mark Hanna, a wealthy Ohio industrialist and a leader in national Republican politics, became McKinley's benefactor and helped him secure the 1896 Republican presidential nomination. The Democratic candidate was William Jennings Bryan, who supported free coinage of silver, arguing that it would increase the money supply and thus help farmers and small-business owners. McKinley, who advocated retaining the gold standard, defeated Bryan, with Hanna raising large sums of money from big business to support the campaign. The money was used to help fund more than three hundred delegations and more than 750,000 people who traveled to McKinley's front porch in Canton to hear him campaign. "Let us remember that our interest is in concord, not in conflict, and that our real eminence as a nation lies in the victories of peace, not those of war." As president, McKinley signed the Currency Act of 1900 (31 Stat. 45), institutionalizing the gold standard until the 1930s. However, his first term was dominated by foreign affairs and over-seas territorial expansion. When McKinley took office, a national independence movement had arisen in Cuba, seeking freedom from Spain. The United States tried to remain neutral while negotiating a solution acceptable to both sides. On February 15, 1898, the U.S. warship Maine blew up in the Havana harbor. Though later investigation suggested that a boiler explosion sank the Maine and killed its crew, immediate public reaction, inflamed by the newspapers owned by William Randolph Hearst, blamed Spain for the attack. At McKinley's request Congress approved a declaration of war. The Spanish-American War was brief, with Spain agreeing to terms in August 1898. Cuba gained its independence, though the United States reserved the right to intervene to ensure stability. Under the peace treaty, Spain transferred to the United States its claims to Puerto Rico and the Philippine Islands. In addition, the U.S. Congress voted in July 1898 to take possession of the Hawaiian Islands. This territorial expansion increased the United States' international prestige as a imperialist power, but some citizens questioned its constitutionality and whether it fit with the U.S. national character. The U.S. Supreme Court decided the legal question in 1901 in a set of decisions known as the Insular cases. The Court held that these new possessions were domestic territory of the United States, under the full control of Congress, and the residents of these new dependencies did not have the rights of citizens (De Lima v. Bidwell, 182 U.S. 1, 21 S. Ct. 743, 45 L. Ed. 1041; Downes v. Bidwell, 182 U.S. 244, 21 S. Ct. 770, 45 L. Ed. 1088). In the 1900 presidential election, McKinley easily again defeated Bryan, who continued to campaign for free silver and against U.S. imperialism. On September 6, 1901, McKinley was shot by Leon F. Czolgosz, an anarchist who had dreamed of killing a prominent person, at the Pan-American Exposition, in Buffalo, New York. An infection set into McKinley's wound, and he died September 14, in Buffalo. Vice President Theodore Roosevelt succeeded McKinley as president.